Pick module safety gates help protect pick workers from the danger of falls while working in the pick module. These spring loaded arms push out of the way during forklift loading, then swing back into protection position as product is removed from the pallet. Put safety first and prevent workers from stepping off a raised platform during loading and unloading of materials. 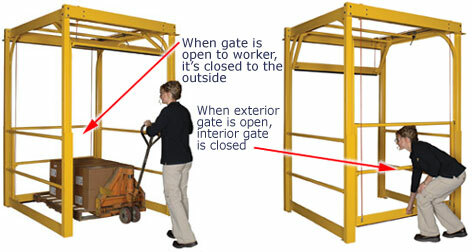 Load and unload using a forklift from the lower level while closing off access at the platform level, then pivot the gate to access at the platform level. Help protect workers from dangerous falls by closing off pedestrian access points that lead to ladders, stairs or platforms without guard rail. Safely move pallets, skids, containers and other loads on and off your mezzanine with a mezzanine safety gate in place. 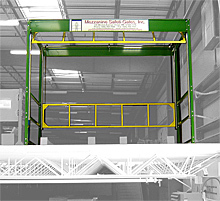 They work with almost any mezzanine, including new platforms or a mezzanine already installed in your facility. They are easy to install and use, providing a system where it is nearly impossible for a worker to accidentally fall from the platform edge.